Brides seeking a classically styled wedding will fall in love with this breathtaking design. 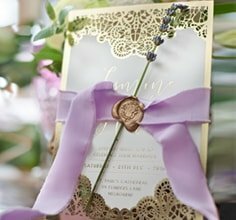 The exceptional combination of brilliant embossing, impressive and elegant silk screening, and delicate foil stamping works together to make this traditional damask inspired wedding invitation stand out. 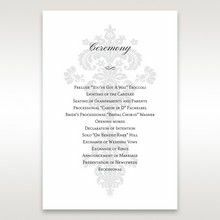 A textured tri-fold insert serves as a folded letter of love to announce your wedding with a romantic verse in extravagant raised ink also available in four other bold colours. A darling white satin bow and embellishment completes this majestic timeless invite that sets the tone for your wedding. The invitation sample was absolutely exactly what I was looking for. 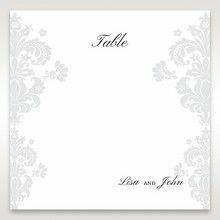 The stationery used is beautiful and of a very high standard. It is really stylish, simple and classic. From the envelope, to the RSVP cards, gift cards and of course the invitation the presentation is so professional and elegant. 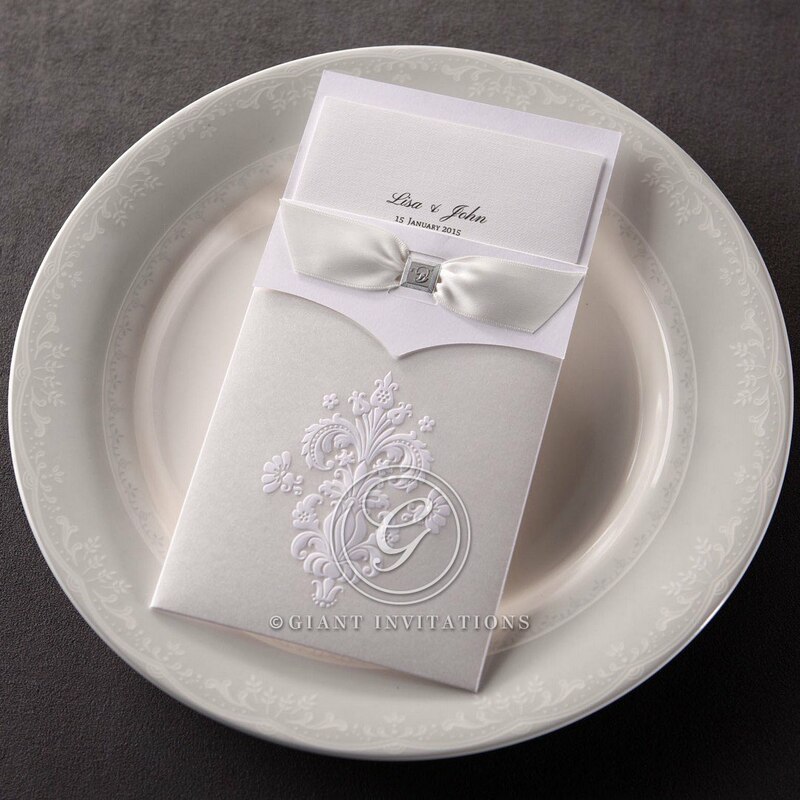 I love the invitation and I'm sure our guests will too! I'll be ordering these for our wedding as I don't need to look any further than this, thanks! I love my wedding invites, they are all I was expecting them to be. I am actually proud to distribute them to my friends and family. Service was also good, professional with a lot of checks before final print was done. Delivery was as initially advised, so all together a very good experience. I will recommend this web-site to others too.Thank you for making this part of my wedding organizing a pleasant experience! Ordered this sample and was completely blown away at how perfect it was for what I was after. Amazing! Can't wait for everything else to arrive. I especially loved the linen paper that slipped in the main invite, as well as the two tone beiges that were on the invite pocket. I love the flexibility in the invite wording, yet the suggested wording helped me plenty to get my desired invite perfect! MY PARTNER AND I ORDERED A FEW SAMPLES FROM HERE AND WE LOVED THEM ALL! SO HARD TO CHOOSE. THIS ONE WAS THE WINNER. IT WAS EASY TO MAKE AN INFORMATION PAGE FOR ACCOMODATION, WISHING WELL AND SCHEDULE TO GO WITH THIS, A SIMPLE 3 COLUMS ON AN A4 PAPER FOLDED FITS PERFECTLY WITH THIS. THE QUALITY OF THE INVITATIN IS BESUTIFUL. THE ELEGANT DESIGN WITH LOSTS OF DIFFERENT TEXTURES IT BEAUTIFUL AND WAS A CROUD FAVOURITE. Had received my samples two weeks ago. It is very elegant and the texture is very high class, highly recommended to people, I'm going to choose this design for my wedding, I love the ribbons too, it is simply gorgeous, it looks simple but it is just perfect, thank you so much to Giant Invitations. The postage is fast as well and the cards are of a reasonable price. Thank you very much. Beautiful design and great quality. 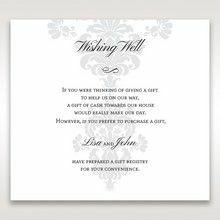 These invitations have a classical elegance. Love this invitation! Service has been excellent and the end product is great value for money. Just received my sample and the invitation looked even better than what I imagined. Will definitely be ordering my wedding invitations through here. Just received my sample via express! Love it, I'm using this for my wedding. The whole process overall is so convenient and easy to personalise, as a bride that needs to keep things simple and well-organised affordable but beautiful, this ticks every box, I love it! Massive thank you for the beautiful invitations. It was well liked.I was very impressed with the service Giants provided. 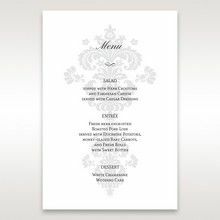 Very helpful with my queries and the turn around to producing amazing and creative invitations and dispatch was very efficient. I was very impressed. I definitely highly recommend Giants to my family and friends and will share your catch the bouquet promo for sure. What economy are they talking about? 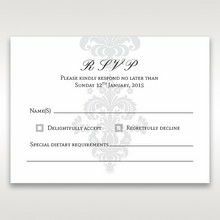 These invitations do not look cheap at all, in fact they look very classy and elegant. Many people in our family have said they were the best invitations they have ever received. 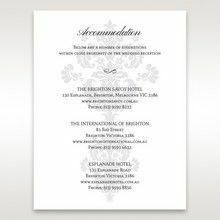 Price, service and quality are AAA+++ So extremely impressed with Giant Invitations, highly recommend to anyone who wants quality and a budget. I ordered a sample of this invitation along with a few others and this invitation just stood out to us. 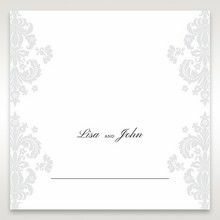 I even asked some family members for feedback and they agreed this invitation was elegant. Ordered a set of samples and this was the most beautiful of the lot. Am looking forward to receiving these for our big day! From the moment I walked into Giant Invitations showroom in Brunswick, I was warmly welcomed by Cassandra who served me with sample invitations for me to choose. 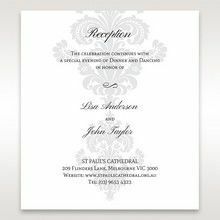 After making my choice and writing up the wordings and selecting the fonts which was finalized and completed on many visits with the time and patience of Cassandra, I finally completed my order on this invitation. I was happy with the outcome and it really looked good to my satisfaction. 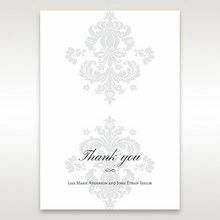 The delivery was prompt and the package was well presented and the count perfect.I would recommend Giant Invitations to anyone looking for printing their wedding invitation. Good Service and prompt delivery. Special thanks to Cassandra for her time and patience. Good Luck and all the best.. This invitation was so beautiful. We received so many compliments on the elegance and craftsmanship of the invitation. Ordering was easy and delivery was very fast. We didn't think we would be able to afford such a quality invitation on our budget. Such efficient service, so happy with the turnaround time. Thank you!! Great service an very easy to use. Amazing designs and friendly staffs. I just received the invitations and they are gorgeous!!! I'm very happy both with the helpful service and also with the loveliest final product! Thank you very much!!! 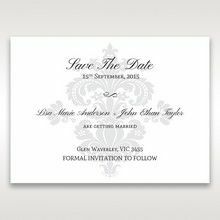 Amazing invitation, this one is just what I was looking for simple and elegant. This invitation also matches the theme and colour scheme of my wedding, it's perfect! We ordered 4 samples and chose this one! It's just sophisticated!! We love it so much! And I must say that chatting with customer service is really helpful! Thank you for your help! Thank you very much for the most beautiful invitations ever!!! they are really beautiful and all my guests love them!!! This invitation is absolutely stunning - one of the most stylish that I have seen. Giant invitations worked with me to make sure my invitations are exactly what I wanted. They are friendly and helpful. I would definitely recommend this website! I ordered some samples. They were free and arrived so quickly! I am so happy with the quality of my samples and can't wait to order my favourite one for our guests! What a great way to allow customers fully experience what they will be ordering. Love! Absolutely loved them, elegant and well made. Very pleased with the quality and the service by the team, especially with my complicated order. Great quality and affordable to match, money well spent! Pretty happy with the final product. Now to send them out! Elegant design and it looks so expensive! The customer service was excellent and delivery was quicker than I expected!